Here are my top 3 favorite eye creams. They are all fabulous and here's why!! 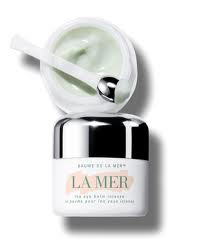 La Mer The Eye Balm Intense: Yes, its a splurge - but I bought it last July and I swear I've barely made a dent! I do not use sparingly either - I slather this stuff all around my eye. I love the cooling feeling of the metal ball tipped applicator. It's always ice cold and feels so refreshing. The balm itself is so rich and heavenly. I have very sensitive eyes and this never burns or stings. I truly feel like the little wrinkles from sun damage are immediately plumped and hydrated. You know how your concealer can crease under your eyes? Since I've been using this those creases are few and far between. I will for sure be buying this again...if it ever runs out! Find it here. La Roche-Posay Active C Eye Cream: There are TONS of Vitamin C eye creams out there, but this one is hands down my absolute favorite. For starters this is a stabilized Vitamin C cream. The packaging allows it to remain stable until you finish the product. It goes through several layers until it reaches the tip where it comes out. SOOO many Vitamin C products out there are packaged incorrectly allowing air and light to get it. Once the Vitamin C is unstable it is completely useless and allows for free radical damage. This is proven to reduce fine lines, wrinkles, and dark circles and pigmentation. I'm a huge fan of La Roche products and this is one of my favorite products they make. You will not be disappointed! Find it here. 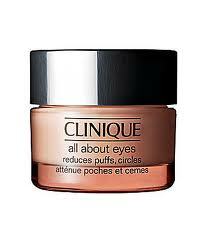 Clinique All About Eyes: A tried and true! This was the first eye cream (it's actaully more of a gel) I ever purchased. Since then I have bought it countless times. It feels so silky and amazing. If your main issue is puffiness - this will be your new best friend! It calms and soothes the puffiness like nobody's business! Keep it in the fridge and it feels even better. Aaahh I want to go slather some on right now! I think keeping the skin around your eyes hydrated (whether you have wrinkles or puffiness) is what really keeps your eyes looking fresh and youthful. If you've never even tried an eye cream this would be an amazing starting point and I guarantee it won't be the first time you buy this! Find it here. On the best way to conceal those circles visit my sweet friend Amanda's blog - you will be glad you did! Click here! I keep this little makeup bag in my purse for quick touch ups! I usually switch lip colors out depending on what I'm wearing at the time. This is what I've been toting around lately! These are all nice staples to keep in your purse just in case! Yay!! They finally came! I am following up to my post about ordering the Oz palettes. They are here in all their glory, and I'm so excited to share the gorgeousness with you! I'll start with the Glinda palette because I think it's my favorite! Wow! It is so much prettier in real life. Very girlie with its purples, pinks, and golds. The colors are so pigmented and are absolutely stunning. The eyeliner is the prettiest deep plum and the lipstick pencil would be perfect for everyday use. The Theodora palette has so many pretty browns, golds, olives - it's a great palette for every day use or to jazz it up a bit at night. I think it would be the most wearable of the two. It comes with a basic dark black eyeliner and a red lipstick pencil. Those are always nice to have handy!